We haven’t exhaustively discussed all the genes that can affect dog appearance. For example, what gene (or genes) causes the English Springer Spaniel in Figure 29 to be red? What gene(s) cause it to be speckled on it’s back? Or lead to its freckles? There are estimated to be about 19,000 genes in the dog genome (Ostrander, 2005). The interactions of all these genes together lead to the overall phenotype of one individual dog. 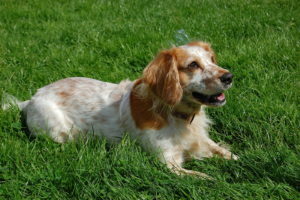 If you’re interested in learning more about the genes that are involved in the appearance of dogs, check out the Dog Coat Color Genetics website at http://www.doggenetics.co.uk. Ostrander EA, Wayne RK. 2005. The Canine Genome. Genome Res. 15: 1706-1716.